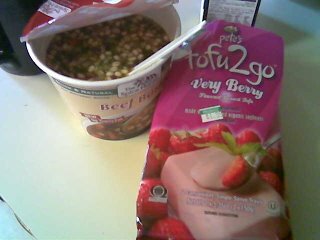 The Tofu Dessert is 200 calories for the two servings in the package, and the instant Beef Barley is another 180 calories. Oddly, the dessert is probably the healthier portion of today's lunch. As an accompaniment I had some Chai sweetened with a bit of calorie free Stevia.